Today I found out laminated glass, also known as “Safety Glass”, was invented by accident. Laminated glass can be found in car windshields, bank teller protective barriers, and a variety of other places where shatterproof glass is a necessity. This type of safety glass was invented by Frenchman Édouard Bénédictus. Bénédictus is probably more popularly remembered for his art, but he also was a bookbinder, writer, composer, and, more to do with this article, a chemist. One fateful day in 1903, when working in his lab, Bénédictus accidentally knocked a glass flask off of his desk. Rather than the glass shattering, spreading tiny pieces of glass all over the floor, instead, it simply broke while more or less keeping its form. Upon further investigation, Bénédictus found that the glass had at one time contained plastic cellulose nitrate, which had dried on the flask and created a type of adhesive film coating the inside, which kept the glass from shattering in the normal fashion. There are conflicting reports on whether Bénédictus immediately realized the potential of his discovery or whether it took him reading about several automobile accidents where people were seriously injured due to their windshields shattering, sending shards of glass flying everywhere. Whatever the case may be, eventually, Bénédictus was inspired by this experience with his flask to create a type of shatter proof glass. The resulting safety glass was made shatter proof using much the same method as how his flask had accidentally become shatter-proof. Specifically, he made his safety glass by bonding a layer of celluloid between two layers of glass. Once the process was perfected, he filed for and received a patent for his laminated glass in 1909. While his safety glass wasn’t immediately adopted by automobile manufacturers, it did become very popular during WWI, being used in eye pieces of gas masks. Laminated safety glass began being used in automobile windshields in 1927. 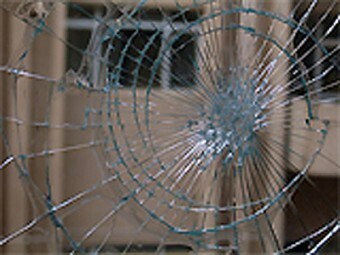 Multiple layers of laminated safety glass can also be used as a form of “bullet-proof” glass and is often used by banks for this purpose. Besides the obvious benefits to using shatterproof glass in skyscraper windows, laminate safety glass also has a much higher probability of the entire window pane staying in its frame during an earth quake over something like tempered glass, as the building sways and bounces. Tempered glass is another type of safety glass. It is typically made by heating a single sheet of glass and then very quickly cooling it, to harden the glass. This tempering process increases the strength of the glass around 5-10 times that of untempered glass. Tempered glass has another major benefit over untempered glass in that, unlike non-tempered glass, when it does break, it doesn’t usually shatter into sharp shards of glass. Rather, it breaks into tiny little glass pebbles, which are significantly less likely to harm someone in the event of something like a car accident. While laminated glass is used in the windshields of cars, tempered safety glass is typically what is used in side and rear windows in automobiles. The reason for this is primarily because laminated glass is difficult to cut through, making it hard for safety crews to get to injured passengers within cars. They have no such trouble with tempered safety glass. Tempered glass can also be shattered into those tiny glass pebbles in the case of being trapped in a car, such as if it becomes submersed. It would be significantly more difficult to get out of a car through a window in such a situation, if it were laminated glass in the side and rear windows. Many types of eye-wear also use tempered safety glass. The glass here is often tempered using a chemical process, rather than heat. You’ll typically find tempered glass in computer monitors, skylights, refrigerator shelves, oven doors, storm doors, etc. If you’re wearing polarized sunglasses and it’s a sunny day, you can tell if a particular piece of glass you are looking through is tempered or not. Simply let the sun shine through it and tilt your head 90 degrees to the side. If it’s tempered, you’ll see a pattern appear in the glass. Since 1936, most laminated safety glass is made using polyvinyl butyral stuck between two layers of glass. Polyvinyl butyral is extremely flexible/stretchable and is also quite strong. It also makes for crystal clear safety glass. This is particularly important in applications like car windshields as it makes for clear visibility and helps keep a person from being ejected from the car through the windshield, which significantly increases their chances of surviving a crash if they weren’t wearing their seat belt. The most popular modern process of creating laminated safety glass is to take two layers of annealed glass and place a layer of polyvinyl butyral between them. The glass is then run through a series of rollers which are designed to expel any air pockets in between the layers. During this process, the glass is also heated in a pressurized oil bath to around 160 degrees Fahrenheit (70 degrees Celsius) in order to bond the layers together. Most laminate safety glass naturally blocks out about 97% of UV radiation.